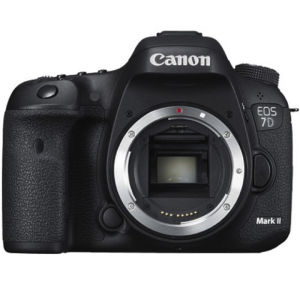 Canon’s 7D Mark II is the top APS-C camera on the market. It has a crop frame sensor which yields equivalent focal lengths of 1.6x that listed on your lenses. Additionally, 20.2 megapixel resolution offers plenty of detail, which makes the 7D Mark II a favourite for wildlife photographers looking for extra reach out of their lenses. The camera has a very high frame rate of 10 frames per second, which is great for action and wildlife. Complementing that is an extremely fast, advanced autofocus sensor array with 65 points, capable of quickly and accurately tracking moving subjects. The 7D is great for tracking birds in flight. The 7D Mark II also has an advanced metering system and great high ISO performance; images are useable up to very high ISOs. Some handy features include built-in bulb timer and intervalometer useful for astro photography and a built in GPS and magnetic compass to add location and orientation data to your files. The camera is technically and ergonomically very well thought out; it has a great build quality and feels like a top quality camera. For all of the professional level features and build quality, the price is fantastic. The crop frame sensor is great for getting more reach out of your lenses, but it’s not as good as Canon’s more expensive, professional full frame cameras like the 1D X or 5D Mark III in terms of absolute image quality. If you plan to make huge prints or need the best low light performance, a full-frame camera would be better. The price is high compared to other crop frame cameras, but the 7D Mark II is built like a professional model, and it’s a bargain compared to its full-frame competitors.